Blurring the boundary between art and light, the Adot Butterfly LED wall/ceiling light combines beautiful form with artistic illumination for a striking decor accent. 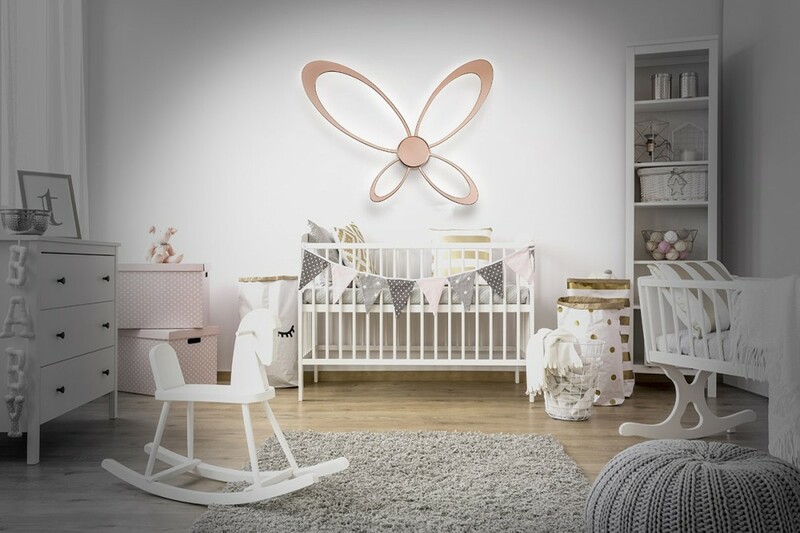 The decorative light fixture captures the poetry of illumination through its butterfly inspired design, making it a statement piece that ensures that it's always springtime in your home. Suitable for wall or ceiling mounting, this marvelous blend of distinctive geometric forms and innovative optical engineering creates a compelling ambiance that turns a wall or ceiling area in your home into a modern art gallery. The fabulous light fixture is a super addition to living rooms, bedrooms, entryways, foyers, hallways or areas where an art piece would be welcomed. Measuring 31 1/4" wide and 26 1/2" high, the LED wall/ceiling light is silhouetted from four oval loops that form the wings of a butterfly. The forewings and hindwinds converge in a cylindrical center box that is 4 3/4" in diameter and 3 1/2" in depth. Made of aluminum alloy, the oval loops and center box combine to portray a lifelike butterfly while providing a durable frame that supports the LED modules and houses the LED driver. 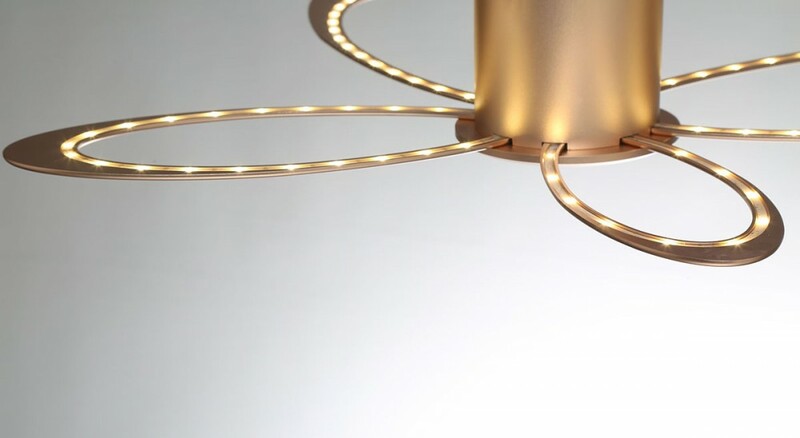 The flexible, linear LED modules are lined along the inner borders of the oval aluminum loops on the reverse side of the light fixture. 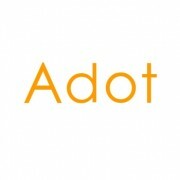 The light modules illuminate the wall or ceiling across a setback distance defined by the center box. With single-bounce indirect lighting, high intensity spot beams from the directional LED light source are softened and scattered through diffuse reflection. 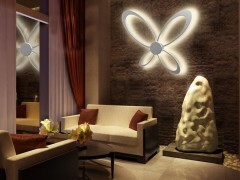 Light bounces back from the surface of a wall or ceiling and creates a luminous halo of butterfly silhouette. The exceptional luminance of the Butterfly is delivered by Lumileds LUXEON 3014 LEDs which offer an optimized combination of light quality and light output, along with the efficacy, lifetime and reliability that all LUXEON LEDs are renowned for. These SMD LED packages are soldered to strips of MCPCB and are overmolded with colloidal lenses which regulate beam direction and provide watertight and dustproof protection for the LEDs. 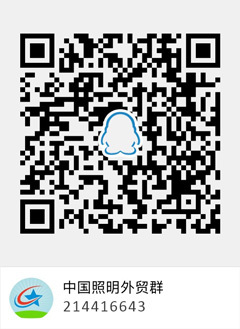 The LED modules are embedded in the grooves of aluminum loops which provide enough surface area and thermal conduction capacity to effectively cool the LEDs. A high efficiency LED driver is installed in the center box and provides constant current outputs matched to the electrical characteristics of the array of LEDs. 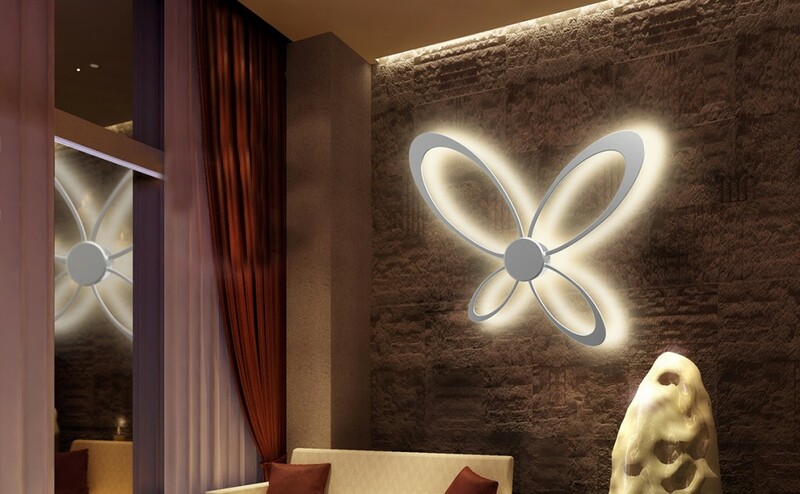 The Butterfly LED wall/ceiling light radiates contemporary beauty with a visible quality achieved through superior mechanical engineering and high attention to details. The aesthetically appealing but mechanically challenging frame is machined from a single piece of aluminum through high precision CNC metalworking. Using a proprietary two-step electrochemical anodization process, the metal frame receives a lustrous, eye-catching satin gold or silver finish with superior corrosion resistance and excellent retention of gloss and luster.